Among the classics of ancient Greek and Jewish literature, the literary genius of Luke and Acts has few rivals, but we moderns miss much of the meaning of Luke's two-part drama. Our problem begins with the fact that we read it. We have difficulty hearing Luke-Acts as it would have been heard by ancient listeners -- in public performance by a skilled storyteller. - Publisher Among the classics of ancient Greek and Jewish literature, the story of Luke-Acts has few rivals. Yet we moderns miss much of the meaning of Luke's two-part drama because we read it like any other text and not as it would have been "heard" by ancient listeners -- in public performance by a skilled storyteller. "The Way according to Luke" unlocks the big picture of Jesus' mission by attending to the repetition, patterns, and other clues of oral narrative. In this single volume Paul Borgman lays out a holistic view of the organic unity between Luke and Acts while demonstrating that the meaning of Luke-Acts is uniquely embedded in its narrative. Borgman's distinctive work makes available both the satisfying pleasure of reading the Bible as great literature and the rewarding insight gained from receiving Scripture as it was originally delivered. About "The Way According to Luke"
Among the classics of ancient Greek and Jewish literature, the story of Luke-Acts has few rivals. Yet we moderns miss much of the meaning of Luke's two-part drama because we read it like any other text and not as it would have been "heard" by ancient listeners -- in public performance by a skilled storyteller. "The Way according to Luke" unlocks the big picture of Jesus' mission by attending to the repetition, patterns, and other clues of oral narrative. 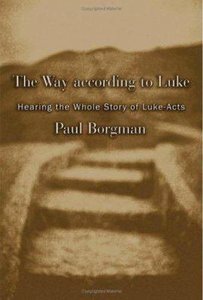 In this single volume Paul Borgman lays out a holistic view of the organic unity between Luke and Acts while demonstrating that the meaning of Luke-Acts is uniquely embedded in its narrative. Borgman's distinctive work makes available both the satisfying pleasure of reading the Bible as great literature and the rewarding insight gained from receiving Scripture as it was originally delivered. Paul Borgman (Ph.D. University of Chicago) is professor of English at Gordon College, Wenham, Massachusetts. A specialist in biblical narrative, he teaches annually in 'the Bible as literature.' Each course approaches books of the Bible on their own terms (as the great literature they are), with literary tools appropriate to the text itself. This same approach is reflected in Paul's three books: Genesis, The Story We Haven't Heard(2001); The Way According to Luke: Hearing the Whole Story (2006), and David, Saul, and God: Rediscovering An Ancient Story forthcoming (2008, Oxford).